It's better looking than the former 5 Series GT. Say hello to the newest 6 Series offering from BMW. The five-door Gran Turismo inherits the role from the slow-selling 5 Series GT in what the manufacturer hopes will be a more appealing package with the longer, swooping lines of the 6 Series. Available later this year, the new hatchback will be sold in the United States solely in 640i xDrive trim, packing the familiar 3.0-liter biturbo six with 335 horsepower. The big news here is obviously the addition of a fifth door. The single-piece hatch opens and closes electrically, and can be operated hands-free with a kicking motion underneath the rear bumper. The stretched roof provides 38.5 inches of rear headroom for passengers, or for cargo duties the rear seats fold to deliver a total of 65 cubic feet of unencumbered space. 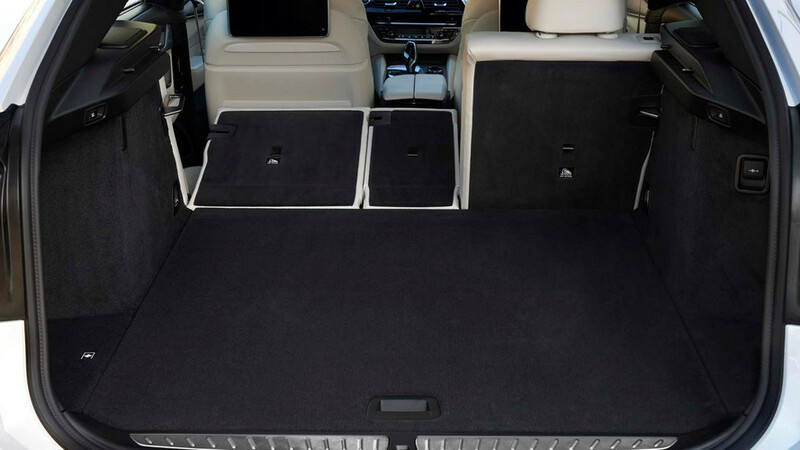 We say unencumbered because the GT features a storage compartment beneath the trunk floor for its removable two-piece luggage cover. Styling wise there are no real surprises that will rock the world of existing 6 Series fans. BMW says the elongated profile catches the eye, with heavily raked A-pillars linking the roofline to the high point at the B-pillar and flowing smoothly to the rear. We’ll sum that all up by saying the stretched hatchback format seems much more at home here as opposed to the 5 Series with its bulky backside and chunky appearance. It should be a pleasure to drive as well. The 640i xDrive GT comes standard with a host of technologies, including Active Driving Assistant which features cameras, radars, and other sensors to constantly monitor the vehicle’s surroundings. They feed information to a variety of safety systems including blind spot detection, lane departure warning, collision warning, and cross-traffic alert. The optional Driving Assistant Plus package adds active responses for most of these systems, such as auto braking, active cruise control, and lane keeping assist. Also standard is an 8-speed Steptronic automatic transmission with paddle shifters and a sport leather steering wheel. Rear air suspension is standard, with air suspension on the front end available as part of the Dynamic Handling Package which, according to BMW, provides both a comfortable ride with sharpened responses for enthusiastic driving. The air system also can be used to raise ride height by .78 inches for extra ground clearance, or drop the car .39 inches for canyon carving. The optional M Sport Package adds a range of visual tweaks inside and out, including a choice of either 19-inch or 20-inch wheels. 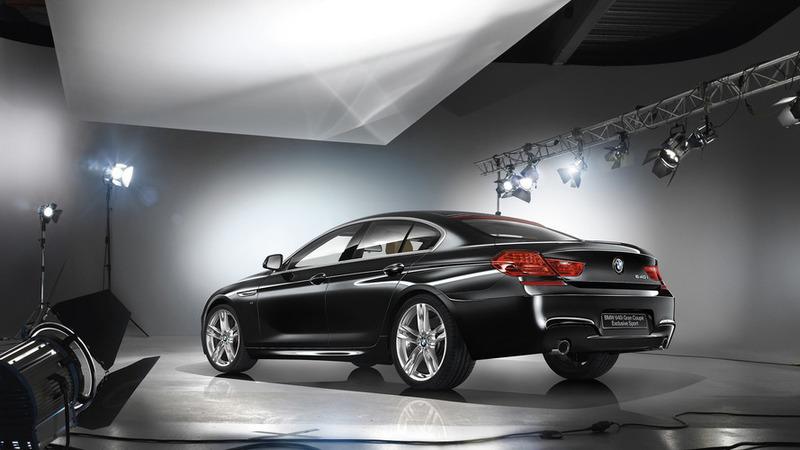 With the biturbo six, BMW says the 640i xDrive GT will sprint to 60 miles per hour in a respectable 5.1 seconds. There’s no word yet on whether additional power options will be available in the future. Given the manufacturer’s recent decision to pull the two-door 6 Series coupe from U.S. shores, it’s likely the executives in Munich will see how buyers respond to the GT before stepping further into the halls of hatchback performance. The 2018 BMW 640i xDrive Gran Turismo will go on sale in the fall with a base price of $70,695 including destination and handling. The All-New 2018 BMW 6 Series Gran Turismo. • Excellence and Luxurious long-distance comfort with innovative functionality. • BMW EfficientLightweight technology uses intelligent lightweight construction with increased use of aluminum and high-strength steels. • Improved aerodynamics with BMW Active Kidney Grille, Air Curtains, Air Breathers and active rear spoiler. • Award winning BMW TwinPower Turbo technology provides dynamic performance. Woodcliff Lake, NJ – June 13, 2017: Today, BMW announced the all-new BMW 6 Series Gran Turismo, which will be available at authorized BMW Centers this fall offered exclusively as a BMW 640i xDrive model. 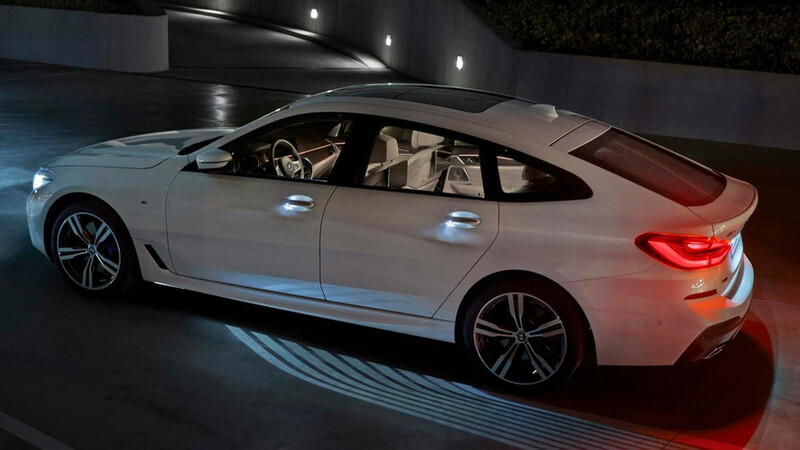 Its distinct coupe-inspired aerodynamic design excites from every angle and combines the long-distance comfort of a luxury sedan with the aesthetic appeal of a coupe. The intelligent lightweight chassis construction paired to the standard 8-speed Steptronic Sport automatic transmission with paddle shifters, improved aerodynamics featuring BMW Active Kidney Grille, Air Curtains, Air Breathers and active rear spoiler, a double wishbone front suspension, standard rear air suspension, and the award winning 6-cylinder engine featuring BMW TwinPower Turbo technology create a sporty and dynamic experience. The all-new 2018 BMW 640i xDrive Gran Turismo will be available at showrooms in the fall starting at $69,700 plus $995 Destination and Handling. Vehicle concept and design. Unparalleled progressive appeal and practicality. The all-new BMW 6 Series Gran Turismo design embodies a rigorous process of development which has elevated both the functional strengths of this concept and the car’s sense of sporting elegance. A generously-sized, flexible-use interior, striking looks, ride comfort, and a luxurious and spacious feel are amongst the features that make this vehicle unique. These attributes have been honed for the all-new BMW 6 Series Gran Turismo and are complemented by stretched proportions, dynamic lines and a muscular look. “The all-new BMW 6 Series Gran Turismo is geared towards discerning customers who place great importance on individuality. It is an eye-catching statement, packaged into a flowing, sculptural design language which gives the car a modern and sporty feel. The raised seating position ensures an imperious brand of driving pleasure, and the luxurious levels of space provide everything you need for a relaxing journey,” says Adrian van Hooydonk, Senior Vice President BMW Group Design. The all-new BMW 6 Series Gran Turismo showcases dynamically stretched proportions. In combination with a roofline that flows deep into the rear end, the proportions ensure an elegantly sporty appearance. Thanks to optimization of the cabin’s packaging, the interior offers ample rear headroom (38.5 inches). Among the other characteristic features of the all-new BMW 6 Series Gran Turismo are its long trunk, the set-back positioning of the cabin, wheelbase of 120.9 inches, doors with frameless windows, and a slim window graphic that leads into a more vertical interpretation of the signature BMW “Hofmeister kink”. The front end: distinctive, eye-catching and powerful. 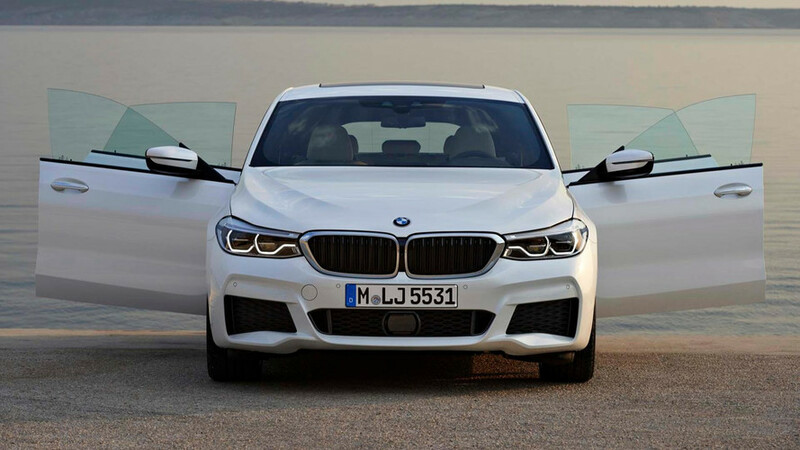 The large BMW kidney grille underlines the muscular presence of the front end. The headlight housings extend all the way to the kidneys, creating a continuous band that accentuates the car’s width. The standard Icon Adaptive Full LED Headlights feature hexagonal LED tubes for the daytime running lights that extend to meet the kidney grille, reinforcing the broad and dynamic presence of the front end. The flanks: flowing lines, precise surfaces. When the BMW 6 Series Gran Turismo is viewed from the side, its elongated proportions and precise surface design catch the eye. A single crease in the upper section of the side surfaces sends light rushing to this section of the body. Above the powerfully flared wheel arches, a second horizontal line worked smoothly into the surface, generates an effective interchange between light and shadow, which lends the car extra lightness and elegance. Its ground clearance is emphasized by the shaded surfaces above the side skirts. The Air Breathers and side skirts form a single unit and team up with another crease in the surface work to enhance the stretched feel of the silhouette. 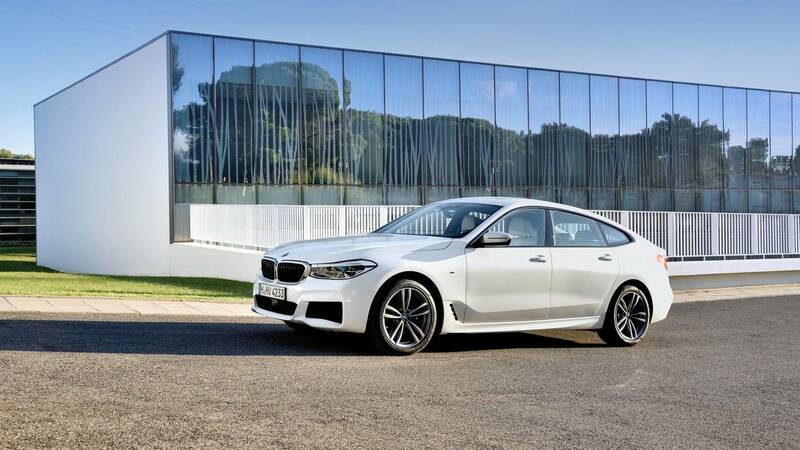 The heavily raked A-pillars of the all-new BMW 6 Series Gran Turismo are linked with the roofline reaching its highest point at the top of the B-pillar, flowing like a coupe’s into the rear. The distinctive elegance of the silhouette is also accentuated by the sweeping side window graphic, which is no longer broken up by an extra window guide strip through the rear passenger door windows. The rear end: width enhances sporting presence, sculptural light design. Horizontal lines, sharp edges and heavily tapering surfaces help to magnify the width of the rear and therefore the sporting stature of the all-new BMW 6 Series Gran Turismo. It is an impression strengthened by the slim rear window and rear lights positioned well to the outside. In addition to the customary BMW L-shape, the light units also display a unique three-dimensional surface design. The taillight covers over the LED units to add a bold and classy accent with their attractively sculpted design. Aerodynamically optimized – from Active Kidney Grille to the active rear spoiler. 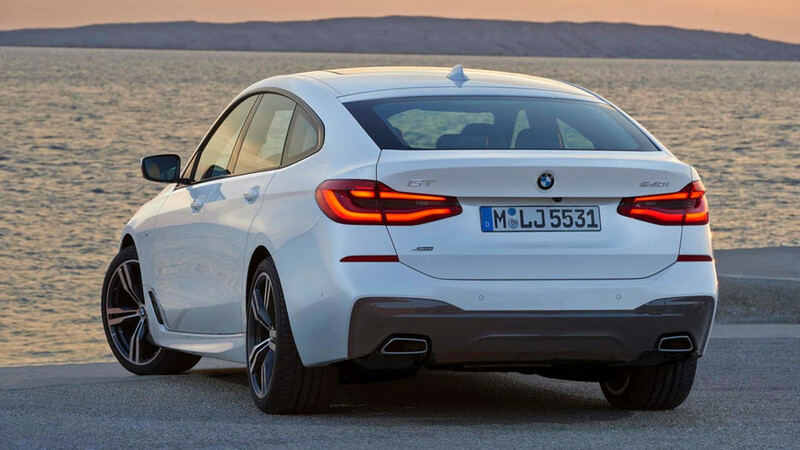 The low-slung silhouette of the all-new BMW 6 Series Gran Turismo also benefits its aerodynamic efficiency, which has been improved with a host of other measures. BMW’s Active Kidney Grille system opens moveable slats behind the vertical, fixed kidney grille slats when more cooling air is required, but otherwise keeps them closed to optimize aerodynamic efficiency. The underbody section is almost fully enclosed. Air Curtains in the lower air intake at the front of the car and Air Breathers behind of the front wheels reduce turbulence in and around the wheel arches all improving aerodynamic efficiency. The active rear spoiler, which automatically extends when the car exceeds 75 mph and retracts again when it slows below 50 mph, helps to reduce lift and improve the drag coefficient (Cd). A total of 12 colors, wheels in 19-inch, 20-inch and 21-inch sizes. Two non-metallic and 10 metallic color shades are available for the all-new BMW 6 Series Gran Turismo. Customers can choose from a total of 3 different light-alloy wheels (19-inch and 20-inch). The Original BMW Accessories range also includes 21-inch light-alloy rims. passenger are welcomed by standard Sport Seats with power adjustable side bolsters, an Anthracite headliner, and a and a SensaTec upholstered dashboard. The optional Luxury Package emphasizes the car’s elegant character with features such as chrome kidney grille bars and front and rear bumper trim finishers on the exterior and power rear seat back adjustment on the interior. M Sport Package. The optional M Sport package offers customers the ability to add design features to the all-new BMW 6 Series Gran Turismo, which emphasize the vehicle’s sporty character. This package includes an M Aerodynamic kit with front apron with larger air intakes, side skirt trim, and diffusor-style rear apron, featuring black fins for the Air Breathers, a special design for the side skirts and rear apron. Other exterior design elements include Shadowline exterior trim and 19-inch M Double-Spoke Wheels with All-season Run Flat Tires or Mixed Performance Run Flat Tires. 20-inch M Double-Spoke Wheels with Mixed Performance Run Flat Tires are available as an upgrade option. The interior includes a new M Sport leather steering wheel, aluminum pedals, and exclusive floor mats when selecting the option of Black Dakota Leather with contrast blue stitching and piping. The M Sport package can be enhanced with the optional Dynamic Handling Package adding Integral Active Steering, Adaptive Drive two axle air suspension, Active Roll Stabilization and Dynamic Damper Control, creating an even more agile driving experience. The versatility of the vehicle concept behind the all-new BMW 6 Series Gran Turismo, the dynamic character of the car and its luxurious levels of long-distance comfort are reflected in the design of the interior. A cockpit tailored to the driver, the extremely generous, variable-use space for occupants and luggage, high-quality design, and carefully selected and precisely worked materials provide all the ingredients for a characteristic BMW driving experience, relaxed traveling and unbeatable practicality within a luxurious ambience. The all-new BMW 6 Series Gran Turismo comes standard with Dakota leather upholstery, which can be specified in a range of different colors. The optional Nappa leather with decorative quilting pattern is available in three colors – Ivory White, Black and Mocha. Precisely formed, seamlessly fitting surfaces and meticulously incorporated chrome trim elements highlight the exclusive character of the interior. The contour of the interior trim strips in the door panels traces the elegant flow of the roofline. Electrically operated sunshades for the rear side windows can be added as an option. Raised seating position and driver-focused cockpit design. Horizontal surfaces lend structure to the instrument panel and interior door trim. In the cockpit, the lines rise dynamically towards the driver and mark out their workplace with unmistakable clarity. The raised seating position enhances the driver’s view out over the road and, together with the ergonomically optimal arrangement of the controls, sends out a statement of imperious driving experience. The iDrive operating system’s Control Display now takes the form of a freestanding touchscreen. The BMW 6 Series Gran Turismo is fitted as standard with an 8-speed Steptronic Sport automatic transmission with shift paddles and a sport leather steering wheel including multifunction buttons for the infotainment, communication and cruise control functions. Rear compartment offers luxurious comfort over long distances. The rear compartment of the all-new BMW 6 Series Gran Turismo has three full-size seats with ample legroom and headroom. LATCH attachment points in the outer seats make it easy to secure the child seats in place. The newly designed rear seat bench helps to improve long-distance traveling comfort and optimize soundproofing. Indeed, acoustic comfort has been enhanced by soundproofing in the roof, doors and rear seat backrests. Multi-contour seats, active seat ventilation and a massage function can be ordered for the driver and front passenger. The optional electrically adjustable comfort seats for the rear passengers feature powered adjustment of the backrest angle at the touch of a button. Flexible-use space and modern functionality. The door pockets for all the seats offer extra storage room for travel items such as regular sized bottles. In the front cabin, there are an additional two cupholders, a roomy glove compartment and a large compartment under the armrest of the center console. The folding center armrest in the rear offers two cupholders. The large, variable-use interior and contemporary functionality of the all-new BMW 6 Series Gran Turismo highlights its qualities when it comes to accommodating luggage. A single-piece tailgate opens and closes electrically as standard, with Comfort Access as standard equipment, this process can be initiated hands-free with a gentle forward-backward kicking motion of the foot underneath the center of the rear bumper. The load sill has been lowered by more than 2 inches. The 40 : 20 : 40 split rear seat backrest can be folded down not only from the passenger compartment, but also by means of electric remote release using a button in the trunk. This expands the available storage space to 65 ft3. The rigid two-section luggage cover can be stored away in a compartment underneath the trunk floor. The standard panoramic moonroof features a two-section glass surface with an overall length of 41.9 inches and a width of 35.4 inches. The two-layer roller-type cover made from acoustically optimized material, runs along side-mounted rails, helps to effectively soundproof the cabin. The all-new BMW 6 Series Gran Turismo is equipped with automatic climate control, which allows individual control of the temperature and ventilation intensity for the driver and front passenger. The standard Extended Ambient lighting provides particularly harmonious interior illumination using LED units in the instrument panel and doors. The color and brightness of the light can be configured as desired. In addition, a light carpet uses illumination sources integrated into the side skirts to generate a striking light graphic by the driver and passenger door. The optional Bowers & Wilkins Diamond Surround Sound System features a fully active 10-channel amplifier with an output of 1,400 watts, plus dynamic sound equalizing, and 16 partially illuminated speakers, produce an exceptionally precise and wonderfully rich sound. Powertrain, driving experience and BMW EfficientLightweight. A fine balance of sporty performance and ride comfort. The 6-cylinder TwinPower Turbo engine for the all-new BMW 640i xDrive Gran Turismo has been selected from the latest generation of the BMW Group portfolio. The remarkable effectiveness of the engine paired to the 8-speed Steptronic Sport automatic transmission with shift paddles, optimized aerodynamics, and its weight-saving construction make the all-new BMW 6 Series Gran Turismo a sporting performer with the highest level of efficiency. The engine features an aluminum construction, optimized thermodynamics and cutting-edge BMW TwinPower Turbo technology. The package of technology is made up of TwinScroll turbocharging, High Precision Direct Injection, VALVETRONIC fully variable valve lift control and Double-VANOS variable camshaft timing. New engine encapsulation reduces noise and accelerates warm-up. The 3.0-liter 6-cylinder inline gasoline engine under the hood of the all-new BMW 640i xDrive Gran Turismo generates maximum output of 335 hp and puts peak torque of 332 lb-ft on tap between 1,380 and 5,200 rpm provide a 5.1 seconds sprint from 0-60 mph. Intelligent networking optimizes dynamics and efficiency. With the help of intelligent networking, the 8-speed Steptronic transmission can adapt its shift strategy to the current driving situation. Utilizing the map database from the standard Navigation system Professional, the intelligent transmission management takes its cues from the upcoming route. For example, on the basis of navigation data it can perform an early downshift when approaching an intersection, in order to take full advantage of the engine braking effect. It also allows unnecessary gear changes to be prevented when taking two bends in quick succession. If ECO PRO mode is selected using the Driving Dynamics Control switch, the coasting function decouples the powertrain whenever the driver lifts off the accelerator between 30 – 100 mph. Intelligent networking also improves the efficiency-boosting effect of the Auto Start Stop function. The control unit uses data from the navigation system and the driver assistance systems’ cameras and radar sensors to prevent the engine being switched off at moments where it would be counterproductive for efficiency – for example when pausing briefly at intersections or traffic circles. Cutting-edge chassis technology, rear-axle air suspension as standard. Thanks to a rigorous round of chassis development, the all-new BMW 6 Series Gran Turismo offers lively agility and, at the same time, unbeatable ride quality. The double-wishbone front suspension and five-link rear suspension underpin a smooth balance between dynamic sharpness and comfort. The front suspension decouples the wheel location and damping functions to avoid compromising comfort under high lateral acceleration, allowing the steering to remain as unaffected as possible by bumps in the road. The rear suspension uses light-metal components in the five-link rear suspension, and optimized elastokinematics ensure precise wheel location and excellent directional stability. The large mounting and supporting system also plays an important part in ensuring good acoustic insulation between the powertrain and suspension. Standard specification includes rear-axle air suspension with automatic self-levelling, which maintains a constant ride height regardless of driving situation or payload, while at the same time controlling vibrations. The electromechanical steering system with standard Servotronic function (for speed-sensitive power assistance) offers unbeatable precision in dynamic cornering situations and high levels of comfort when maneuvering in tight spots such as parking lots. The optional Integral Active Steering is likewise electromechanical. Controlled steering of the rear wheels allows it to provide extra agility when cornering, sure-footed responses when changing lanes and easy maneuverability around town. Adaptive suspension and Active Roll Stabilization deliver ride comfort and sporty performance. The Dynamic Handling Package offers an extra dose of sportiness. It complements Dynamic Damper Control and the two-axle air suspension with Active Roll Stabilization and Integral Active Steering. Adaptive suspension with Dynamic Damper Control and two-axle air suspension uses electronically controlled dampers to improve ride and suspension comfort while at the same time sharpen the car’s dynamics. An electrically powered compressor with pressure reservoir supplies the suspension with air and because the air supply is controlled individually for each wheel, it is even possible to compensate for an unevenly distributed load. The two-axle air suspension enables owners to set the car’s ride height manually. Ground clearance can be raised by 0.78 inches at the touch of a button for driving on rough ground or up steep ramps. Once the driver accelerates beyond 22 mph, the self-levelling system automatically reverts to the standard setting. A 0.39 inch drop in ride height can be initiated by pressing a button. This happens automatically at speeds over 75 mph and when SPORT mode is selected using the Driving Dynamic Control switch. Active Roll Stabilization works using electric swivel motors and takes fast, precise action to counteract body roll during dynamic cornering, while also improving comfort in straight-line driving by actively countering bump disturbances affecting only one side of the car. Driving Dynamics Control switch with ADAPTIVE and COMFORT+ mode. As well as ECO PRO mode, the standard Driving Dynamics Control toggle switch is also used to activate the COMFORT and SPORT settings. These different modes, selected at the press of a button, modify the accelerator and steering mapping, the shift characteristics of the Steptronic transmission and the responses of the electronic dampers, if specified. Choosing the Dynamic Handling Package also adds the COMFORT+ and ADAPTIVE modes. These allow drivers to select a particularly comfort-biased set-up or one that responds automatically to their driving style. In ADAPTIVE mode, navigation data from the Navigation system Professional is used to proactively adjust the car’s responses when approaching intersections or curves. BMW EfficientLightweight technology allows for optimized weight distribution and low body weight. Intelligent lightweight construction and the increased use of aluminum and high-strength steels for body and chassis components has optimized the weight of the all-new BMW 6 Series Gran Turismo. The doors, the trunk and the car’s tailgate are made from aluminum. The engine cross-member, spring struts and rear trailing arms are among the chassis components made from lightweight metal. Reducing unsprung mass in the wheels and brakes make the all-new BMW 6 Series Gran Turismo even more agile. A steel/aluminum compound construction, galvanized, hot and cold-formed steel plates with a zinc/magnesium coating are all used to improve stiffness and passive safety, and reduce weight. Among the latest innovations in manufacturing technology registered under the BMW EfficientLightweight banner are a laser welding technique for the aluminum door shells and glass-fiber reinforced plastic acoustic shielding for the inner door paneling. Controls and Advanced Driver Assistance Systems. At the heart of the display and control concept in the all-new BMW 6 Series Gran Turismo is the iDrive 6.0 system. In addition to the Touch Controller on the center console and the direct menu control and favorites buttons, the system also comprises a new version of the Control Display. The high-resolution unit now takes the form of a freestanding 10.25-inch touchscreen, while intuitive touch control is facilitated by the tile-style menu layout with live content. The Intelligent voice control system has undergone improvement and now also responds to natural voice inputs. The available BMW Gesture Control can be used in the all-new BMW 6 Series Gran Turismo too, allowing certain functions to be operated with simple movements of the hand or fingers, which are registered by a 3D sensor in the center console and translated into the relevant commands. The latest generation BMW Head-Up Display, whose projection area has been increased in size by 75 percent reflects driving-related information onto the windshield in full color and with a resolution of 480 x 800 pixels. BMW Personal CoPilot paving the way to automated driving. The BMW 6 Series Gran Turismo is the first BMW with a standard Active Driving Assistant. This system brings a multitude of driving assistant functions made possible through the use of cameras, radars, and ultrasonic sensors that monitor the vehicle’s surroundings. The Active Driving Assistant includes Active Blind Spot Detection, Lane Departure Warning, Daytime Pedestrian Protection, Frontal Collision Warning w/City Collision Mitigation, Speed Limit Info, and Cross-traffic alert rear. The optional Driving Assistant Plus Package also adds Active Cruise Control with Stop & Go, Active Lane Keeping Assistant with Side Collision Avoidance, Traffic Jam Assistant, Evasion Aid and Cross-traffic alert front. The latest generation ACC with Stop & Go is operational in a speed range from 0 – 130 mph and is capable of braking the vehicle to a standstill. If the vehicle has been placed into standby mode by pushing the resume button on the steering wheel, the all-new BMW 6 Series Gran Turismo can automatically start moving again up to 30 seconds after coming to a full-stop, relieving stress on the driver considerably, particularly when driving in stop-start traffic. The system’s sensors can now register two vehicles ahead providing a smoother operation. The Active Lane Keeping Assistant and Traffic Jam Assistant – also active at speeds between 0 and 130 mph – represent another step towards semi-automated driving. It uses road markings and the vehicles driving ahead as a means of orientation and works with the driver to help keep the vehicle in the detected lane with steering assistance. The system designed as a hands-on system, provides up to 50 seconds of hands-off time steering support. A sensitive hands-on-wheel detection recognizes contact even when only a few fingers briefly touch the wheel. The latest generation Active Blind Spot Detection system now ranges from approximately 15 – 130 mph and Lane Departure Warning, which operates from approximately 40 – 130 mph. Lane Departure Warning, alerts the driver if the vehicle is straying out of its lane unintentionally by causing the steering wheel to vibrate. Active Blind Spot Detection monitors maneuvers when changing into a different lane and, if a risk of collision is detected, activates a visual signal in the side-view mirror and vibrates the steering wheel, encouraging the driver to steer the vehicle back into its original lane. Vehicles equipped with the available Active Driving Assistant Plus additionally include Active Lane Keeping Assistant with Side Collision Avoidance and Evasion Aid, which assist the driver with corrective steering. The Side Collision Avoidance system (range approximately 40 – 130 mph) provides corrective steering intervention in situations where a side collision is imminent. In addition, Lane Departure Warning and Active Blind Spot Detection are also supported by the Active Lane Keeping Assistant through corrective steering intervention as part of the warning concept. Evasion Aid assists if a quick lane change is required at speeds between 25 – 100 mph, for example when the vehicle in front brakes aggressively, the evasion aid supports the necessary evasive steering action initiated by the driver. Corrective steering support during an evasive maneuver results in less vehicle instability, assisted by Dynamic Stability Control (DSC). While executing the maneuver, the evasion aid also uses information from the vehicle’s sensor systems to check how much unobstructed space is available around the vehicle. At speeds over 100 mph, the system no longer provides actual steering support and instead focuses on maximizing vehicle stability. Intelligent systems offer a clearer view and warn of dangers. Assistant Plus additionally include Cross-traffic alert front for forward maneuvers when exiting parking spaces or driveways with obstructed views. The BMW Night Vision system offers greater safety at night by providing a real-time video image in the Control Display that highlights any pedestrians, larger animals or other objects radiating heat. Automatic parking: Parking Assistant, Remote Control Parking. The all-new BMW 6 Series Gran Turismo’s Parking Assistant enables the automatic selection and use of parallel, perpendicular and angled parking spaces. Suitable spaces are detected with the help of ultrasonic sensors when driving past them. The system then takes care of all the acceleration, braking, steering and gear changes required to maneuver into the space. The BMW Remote Control Parking feature offers the ultimate in convenience when it comes to parking the car. The function is supervised by the driver who is able to initiate the required maneuver to move forwards into narrow parking spots or back out of them again from outside the vehicle using the BMW Display Key. All acceleration and braking actions are monitored and controlled by the Park Distance Control (PDC), the Parking Assistant and the Surround View sensors and cameras. The engine is started and switched off by remote control with the BMW Display Key. BMW Connected and ConnectedDrive. Intelligently connected with the digital world. The BMW Connected App uses intelligent connectivity to assist drivers of the all-new BMW 6 Series Gran Turismo. Through the power of the Open Mobility Cloud, your smartphone and vehicle are connected in ways which bring unparalleled convenience and peace of mind. The digital personal mobility assistant helps reach the destination easily and with minimal stress – and not only when they are in their car. BMW Connected becomes an integral part of a digital lifestyle. BMW Connected personalized services can be used on the Apple iPhone or Apple Watch, for instance, or on smartphones and smartwatches running the Android operating system. This turns the personal mobility assistant into a seamlessly integrated component of the driver’s digital life, available anytime and anywhere. With BMW Connected, the mobility experience is always with you. Agenda-related information – such as the appointments and addresses contained in calendar entries are detected and taken into account when computing the route for your trips. The app then calculates the ideal departure time based on the latest traffic information and notifies the driver accordingly with a message on their smartphone or smartwatch. When the driver starts their car, which is also connected to the Open Mobility Cloud, its navigation system can access the route directly. BMW Connected is also an adaptive system that is capable of automatically learning and storing places that are regularly visited and personal mobility patterns. Infotainment, convenience and safety broaden their reach. The standard built-in SIM card also allows drivers of the all-new BMW 6 Series Gran Turismo to use Intelligent Emergency Call with automatic locating and accident severity detection. With the new BMW Teleservice Accident Assistance, the vehicle now also detects low-speed collisions below the threshold for airbag deployment. The driver receives a message in the iDrive display offering to contact the BMW Accident Assistance service directly. A push of a button is all it takes to obtain professional support from the BMW Accident Assistance team, who can also put the customer in touch with a BMW Service Partner if necessary. Navigation updates over the air, hazard warnings based on car-to-car communication, Advanced Real Time Traffic Information, On-Street Parking Information. The latest generation of the Navigation system Professional boasts quicker start-up, even faster route calculation and optimized 3D rendering of urban map graphics. Thanks to the automatic regional map updates, included in the first four years, the navigation data is updated at regular intervals over the air using the vehicles mobile connection. Through crowd-sourcing, the vehicle also transmits data on the speed limits detected by the Speed Limit Info system to the BMW backend, from where the on-board navigation map can be updated at any time. Car-to-car communication is now also employed within the inter-connected BMW fleet to provide advance warning of hazardous traffic situations. Information on any detected hazards presented by an accident, a broken-down vehicle, dense fog, heavy rain or black ice, for example, is also relayed to the BMW backend from where it is imported into the navigation system of both the driver’s car and other BMWs in the vicinity. The unique On-Street Parking Information service helps drivers find available street parking space. This function is integrated into the navigation system map in a similar way to Advanced Real Time Traffic, and by using intelligent connectivity it displays the likelihood of available roadside parking spaces based on historical and real-time data. Apple CarPlay available in the car. Apple CarPlay can be used wirelessly in the all-new BMW 6 Series Gran Turismo. 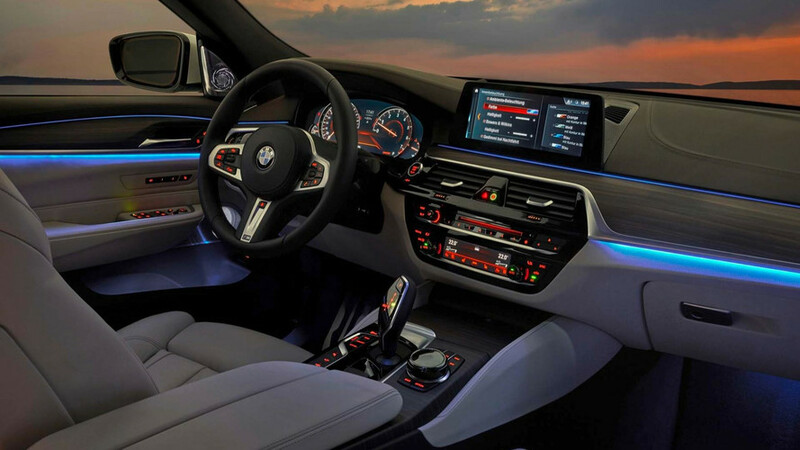 The driver can seamlessly switch between BMW and Apple CarPlay via the iDrive controller or touch screen interface. Permanently connected – with the Display Key and Remote 3D View. The BMW Display Key, available exclusively with Remote Control Parking, allows drivers to keep in contact with their BMW 6 Series Gran Turismo around the clock. Besides fuel level and service-related information, the color display can also indicate whether the car’s doors, windows and panoramic glass sunroof are closed. Meanwhile, with the BMW Connected App, the Remote 3D View function shows drivers a three-dimensional live image of their vehicle and its immediate vicinity, as generated by the Surround View camera system, directly onto their smartphone screen.